Need a carrier for an upcoming holiday? Some of my carriers are more widely traveled than I am! 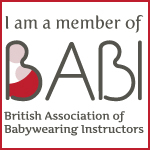 These meets are perfect for anyone wanting to learn more about baby carriers, get some tips with a carrier you already own, try on a couple or to borrow something for an upcoming holiday. We have some lovely cool carriers if your traveling somewhere hot!